BLUEWATER LAKE -- Looking for a chance to catch a state-record fish? Your best chance may be this year at Bluewater Lake, where the state-record for tiger muskie has changed hands three times in the last year and a half, with many near-misses along the way. Justin Easley of Edgewood is the current record-holder with a monster 46-inch fish that weighed a whopping 31 pounds, 14 ounces. There have been several close contenders, the most recent a 48-incher caught by Benjamin Silva that fell short in weight at 28 pounds. The New Mexico Department of Game and Fish awards state records based on weight alone. Easley caught his record muskie May 10 of this year while casting a Jerk-minnow Rapala near the Bluewater Lake dam. Previous records include an 18-pound, .05-ounce muskie caught in June 2011 by Steve Roen of Truth or Consequences, and a 17-pound, 8-ounce muskie caught in May 2011 by young Anastasiah Alfaro of Albuquerque. She caught her muskie on a kids pole after she hooked a trout on Power Bait and then the muskie swallowed the trout. The muskie was almost as tall as her. Big-fish stories like that spread fast and always attract more anglers. The Bluewater muskies have been no exception, especially this year when fish are averaging three feet long and a “keeper” has to be at least 40 inches. Anglers were required to return all muskies to the water until April 2010, when a one-fish, 40-inches-or-larger bag limit was established. The Department of Game and Fish began stocking tiger muskie fry and fingerlings in Bluewater and Quemado lakes in May, 2003, with hopes the aggressive predators would help control overpopulations of goldfish and white suckers. Since then, almost 267,000 muskies have been stocked in Bluewater Lake. More than 120,000 have been stocked in Quemado Lake. With plenty of goldfish and suckers to munch, the non-breeding hybrids between northern pike and muskellunge grew like crazy – some of them as much as 6 inches a year. 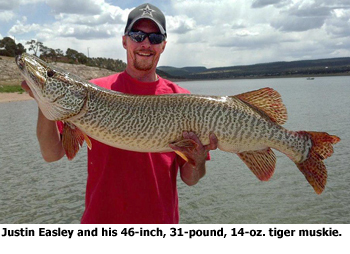 At that rate, it would not be unlikely to see New Mexico overtake the International Game Fish Association’s North American record: a 51-pound, 3-ounce tiger muskie caught at Lac Vieux-Desert, Mich.
New Mexico’s tiger muskies originally were brought in as fry and fingerlings from a hatchery in Pennsylvania. In 2006, the Department of Game and Fish began raising its own muskies from eggs at Rock Lake Hatchery in Santa Rosa. Since then, the hatchery has raised and stocked almost 94,000 muskies in Bluewater and Quemado lakes. Pelletier urges anglers to learn how to properly release tiger muskies that are under the 40-inch size restriction – especially when water temperatures are high. Once temperatures get up into the 70s, fish get very stressed when caught and must be handled carefully if they are to survive when released. Pelletier advises anglers to keep the fish in the water, have pliers and other tools close by, and to release the fish as soon as possible.